Recall that earlier this week we reported that in the May 31 "Daily Observations" letter to select clients, authored by Bridgewater co-CIO Greg Jensen, the world's biggest hedge fund had an ominous, if not dire appraisal of the current economic and financial situation facing the US, and concluded that "We Are Bearish On Almost All Financial Assets"
"while such strong conditions would call for further Fed tightening, there's almost no further tightening priced in beyond the end of 2019. Bond yields are not priced in to rise much, implying that the yield curve will continue to flatten. This seems to imply an unsustainable set of conditions, given that government deficits will continue growing even after the peak of fiscal stimulation and the Fed is scheduled to continue unwinding is balance sheet, it is difficult to imagine attracting sufficient bond buyers with the yield curve continuing to flatten." "We are bearish on financial assets as the US economy progresses toward the late cycle, liquidity has been removed, and the markets are pricing in a continuation of recent conditions despite the changing backdrop." Today, none other than former Fed Chair Ben Bernanke repeated the same assessment almost verbatim in explaining his own suddenly quite dire outlook on the economy. 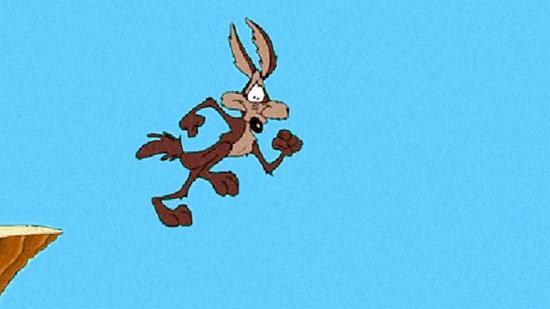 ... is headed for a "Wile E. Coyote" moment in 2020, just in time for Trump re-election, according to Bloomberg. Speaking at the American Enterprise Institute, Bernanke echoed Bridgewater's biggest concern about the sugar high facing the US economy for the next 18 months, saying that the stimulative impact from Trump's $1+ trillion fiscal stimulus "makes the Fed's job more difficult all around" because it's happening at a time of very low unemployment; it also means that the more supercharged the economy gets thanks to the fiscal stimulus, the greater the fall will be when the hangover hits. Stealing further from the Bridgewater note, Bernanke said that while the stimulus "is going to hit the economy in a big way this year and next year and then in 2020 Wile E. Coyote is going to go off the cliff, and it's going to look down" just when the US economy collides head on with what Bridgewater called "an unsustainable set of conditions." And now that Congress has more than done its part, Bernanke predicts collapse in under 2 years. The even bigger irony of course is that the real reason for the upcoming collapse has little to do with Trump whose $1 trillion stimulus is a drop in the bucket compared to the doubling of the US debt under the previous administration and the $20 trillion liquidity injection by Mr. Bernanke and his central banking peers since the financial crisis which have left the world and its capital markets in what Deutsche Bank has described as a metastable condition. But, with a convenient scapegoat currently in the White House, the Fed - and certainly the one person who assured that the bursting of the current asset bubble will be nothing short of spectacular, Ben "subprime is contained" Bernanke, will be more than happy to place all the blame for the upcoming economic crash on who else, Donald Trump. Said otherwise, unlike his successor Janet Yellen, who famously said after leaving office that she believes there won't be another financial crisis in her lifetime, Bernanke just predicted that the entire economy will nosedive in just two short years - far less than the 10 years of additional uninterrupted expansion recently forecast by the CBO. 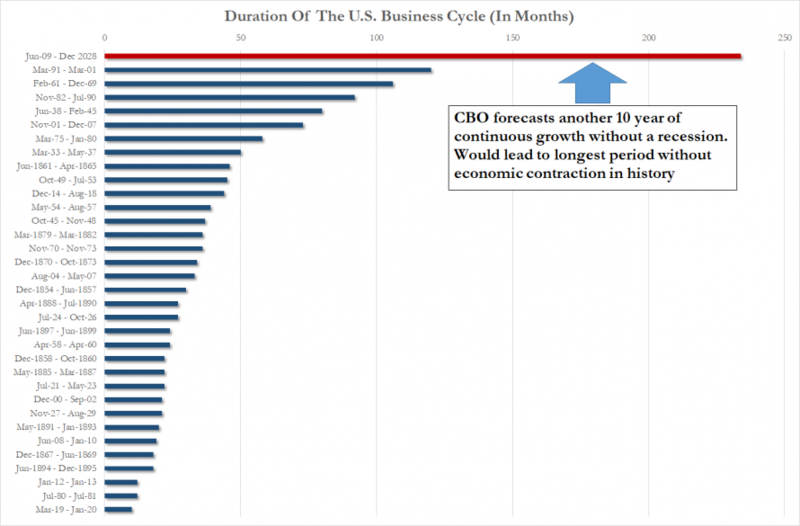 The Congressional Budget Office projects that growth will slow to 1.8% in 2020; meanwhile based on recent statement, the Fed believes Trump's stimulus will cause the economy to "symmetrically" overheat and push inflation, as measured by the PCE Price Index, past the central bank's 2% target, prompting the Fed to hike rates potentially as much as 3.5%-4.0%, or the number that Bernanke said would never be reached in his lifetime. One Bloomberg reporter pointed out the irony in Fed officials blaming the Trump tax cuts for doing too much to bolster the economy. Bernanke was followed at the AEI discussion by former Fed Governor Kevin Warsh and current harsh Fed critic who has repeatedly, and correctly, accused the Fed of blowing what may well turn out to be the final bubble. Currently an economist at Stanford University, Warsh who was once seen as the top contender to replace Janet Yellen, said he would speak loosely from his prepared remarks and joked: "I am not going to speak as loosely as Ben did when he made the Wile E. Coyote reference and what happens to the economy in 2020." Because to the central bankers the bursting of the multi-trillion bubble they helped create and the tragic consequences it will have on the economy is just that: a joke; The only "good news" is that they will at least get to blame everything on Trump. Watch Bernanke's speech below, fast forward to 22 minutes in.